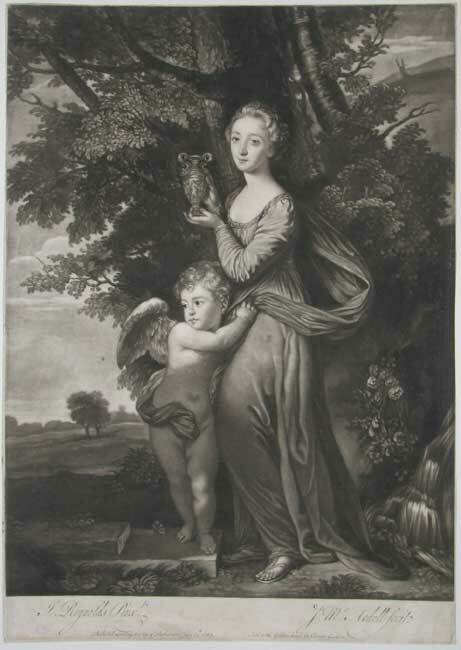 A full-length mezzotint portrait of Frances Greville (1744-1818) with her younger brother as Cupid. Engraved on copper by James McArdell after the portrait by Sir Joshua Reynolds and published in London in 1762. Frances Greville was the only daughter of Fulke Greville of Wiltshire. She married John (later Baron) Crewe in 1766 so this painting and subsequent print would have very much been her coming of age portrait. It was customary in the C18th for aristocratic families to have their prodigy painted by fashionable artists like Joshua Reynolds and Thomas Gainsborough. The paintings would be exhibited in London to much acclaim and then a series of mezzotint portraits would be produced to further promote the image. Prints of well to do ladies would be distributed throughout the land to stately homes where there were eligible sons in want of a wife. Considering Miss Greville made a socially advantageous marriage only 4 years after this print was made one assumes her parents would consider it a worthwhile expense. In this delightful composition Miss Greville adopts the attitude of Psyche whilst her brother plays Cupid. Her brother subsequently fell out with their father who cut out the boy from the original canvas replacing him with an urn. The boy was eventually sewn back in at some stage during the 1860s!